Studio Jules Art - Blog: Back to School - Free Shipping! Back to School Free Shipping! Get ready for Fall with a new scarf or treat yourself to quilting fabric (since you have the house to yourself again!). Use Coupon Code BACK2SCHOOL for Free Shipping at check out in my Etsy shop. 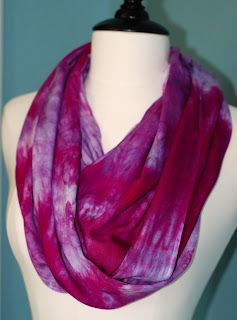 I love dyeing fabric and scarves and hankies. Being able to share this love with others gives me a wonderful feeling. When you wear one of the hand dyed scarves, you will always have someone commenting on the color and the uniqueness of the pattern. The hand dyed fabrics, each of the ice dyed pieces is different and I have started dyeing pieces using the Shibori technique. Today I posted new fat quarters that are in different colors and various Shibori techniques. Do you needlepoint or hand quilt? I have some beautiful DMC pearl cotton to go with your hand work. I love to needlepoint and have hand dyed DMC to work on a project. What a peek? I am doing this to go along with the Four Year Quilt! When I'm done it will be put on a custom made footstool. So, enjoy your day and pop on over to StudioJulesArt on Etsy and use your BACK2SCHOOL Free Shipping code in the Coupon Code section of check out.